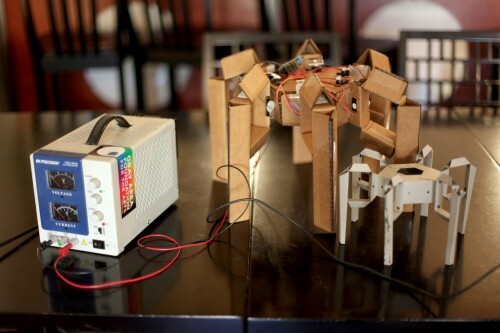 Ever thought of building a hexapodal robot out of cardboard, including servos and controllers for $85 (about £55)? This is a thought process that creator Mike Estee had, and we've got to admit, the DIY, homebrew look of it all (not intentional as it is actually homemade) is awesome. CES has been a time of high-end technological productions, such as Intel's ultrabook concept, the Nokia Lumia 900 and Panasonic's Myspace TV app (...); but it's always refreshing to see something more down-to-earth. The pieces of the robot have been cut out of cardboard, stuck together and conected to a servos, which is then, in turn, linked up to the power supply and laptop controller. Thus far the result is...rather limiting: basic motion with an odd fascination of going round in circles. As the six legs are independently articulated, it can logically be programmed for more functional movement at some point in the future. Mike Estee was allowed the freedom to experiment with the creation of many different variations of the robot design, thanks to the cheap nature of the materials (cardboard specifically). He's made the design available on his blog, and you can read all three parts of the development+building process via the source link below.